Awesome example – I connected to my BeagleBoard xM and started it up with the LCD in one attempt – perfect! This photo is made slightly under angle. Actually, you have direct access to these pins on expansion headers. You can download gerbers and check it yourself. I just want to double check if the PCB board connection for Pandaboard ES is right. Are the following connection combinations correct? Also, in order to place the PCB board, a rubber footing needs to be removed. Is it the way supposed to be? For rubber footing – you can just move it to another place close to our PCB in order to keep board steady on 4 foots. Do we need to take out the Resistor for Panda ES version? Then about the board is it connected to the bottom of the panda ES or the top? from pandaes, reply it is bottom and it will be blocked my the rubber padding of PandaES board. My PandaBoard ES is revision B. 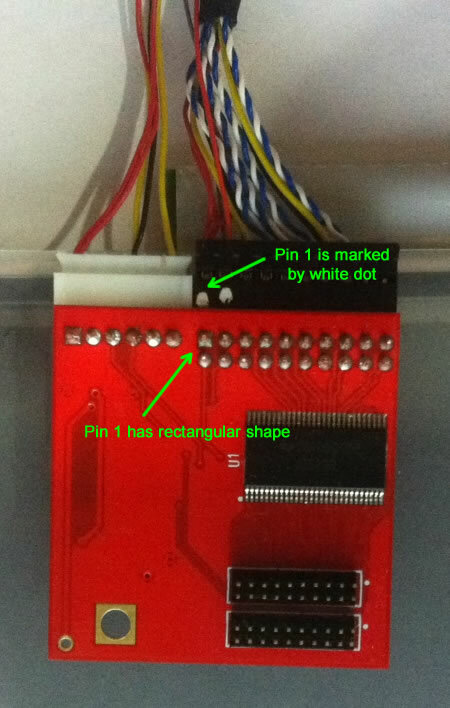 You don’t have to remove/solder resistors for Panda ES – just install headers. Board is connected on bottom side. Rubber padding can be shifted to different location on board (it has glue surface). there is another cable which is usb type, what is that for? is that needed? It could display on the screen, but touch screen does not work, back light seems does not work too (nothing changed under lighting change at ambient sensor). You should recompile kernel to include Multi-touch HID driver to get touchscreen working. Any plans for the next Assembled PCB ver(3) to fit exactly below the pandaboard? We designed board as small as possible to fit right under Panda. the only parts getting out of Panda are LCD/backlight connectors. Actually there are around 3mm in the SPX1567 / power connector side that are off . Just below the pandaboIn your next design you could shift the entire PCB tracks to the conn 1 & 2 side. PS: It is not critical, I used a dremel to remove part of the acrylic box, but will be nicer. Ok, I got what you mean. Unfortunately we can’t shift entire PCB design to the side, because it will overlap I/O extension connectors on Panda. The only way would be to change CON4 to smaller pitch one. I bought a LVDS LCD interface board Ver 2 for Beagleboard Xm and tried to connect it Innolux 10 inch LCD, but I couldn’t get any success.When I look at the connections I saw that RX3+ at header-10×2 pin 20 was connected to GND.Is that normal?Also when I connect it I see only backlights and black screen. Do I need to set bootargs? Do I need to change PIC firmware that includes my LCD’s data? Yes, it is fully compatible with PQ 3Qi-01. PQ101WX01 should be OK as well. We still negotiate with Element14. Ciao Dr. 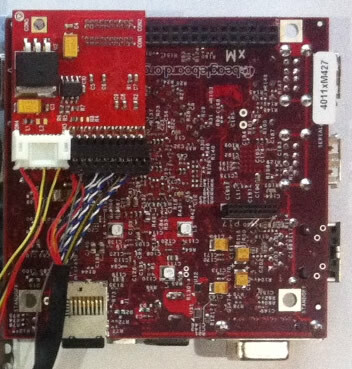 Ace, I’m very tempted to buy a couple of boards for IGEPV2, could you also provide LVDS cables assembled for PQ 3Qi-01 ? Marco, please drop your request to [email protected] with exact qty, they will provide custom invoice to you. It is impossible to solder it wrong way, because our board has mounting hole that should match the hole on IGEPv2. I have 30 Pin LVDS 6-bit (18-bit total RGB) LCD Panel (LG LB070WV8). Will this panel work with the PCB v2? Do you have a different cable that will work with this 30 pin LCD module (rather than the 40 pin module you use in your kit)? Yes, it will work. You have to ask your LCD supplier for LVDS cable. We make custom cables for our LCDs, and unfortunately can’t supply cables for third-party panels. Usually, our sales team answers in 1-2 days.